My paternal grandfather, Walter George Robson, worked for Harris Lebus in 1939, as I discovered whilst reading through some old family letters recently. I don’t know how long he worked for Lebus’s but I do know that he was a French polisher when I was a child in the 1950s and remember him bringing home sacks full of wood offcuts for my nan to burn on the cooking range in their front room in Wier Hall Road. 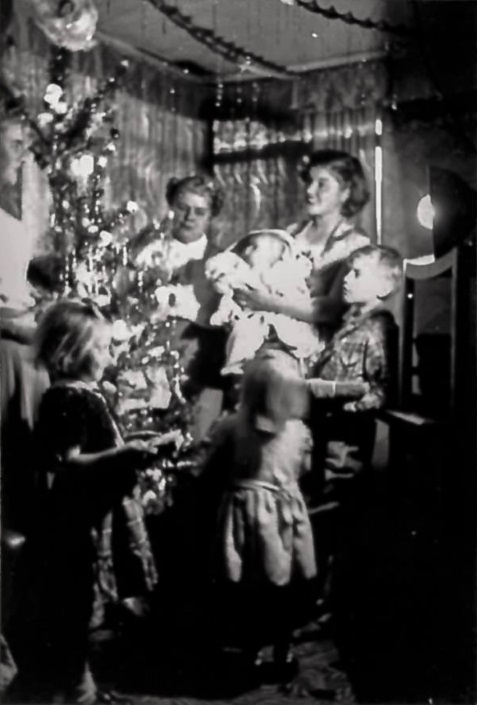 I lived, with my two sisters and brother and Mum and Dad in a prefab right at the top end of High Cross Road. Dad decided to paint the prefab pale blue which didn’t please Mum much because he painted it with a distemper paint that rubbed off on our clothes if we brushed against the outside walls of the prefab. My memories of living in the prefab are all good. 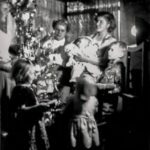 It had two bedrooms, one for Mum and Dad, and the other shared with my two sisters and my brother, my sisters and I slept in a double bed and my brother in a single. Dad made a dressing table for us girls from two orange boxes with a piece of wood stretched across the top, my sister had one side for her treasures and I had the other. Christine was a baby and so didn’t get a special space. With a mirror on top and a curtain fixed around the front and sides, we loved it. The kitchen had all mod cons, a cooker and a fridge and dropdown table that folded up into the wall when not in use. 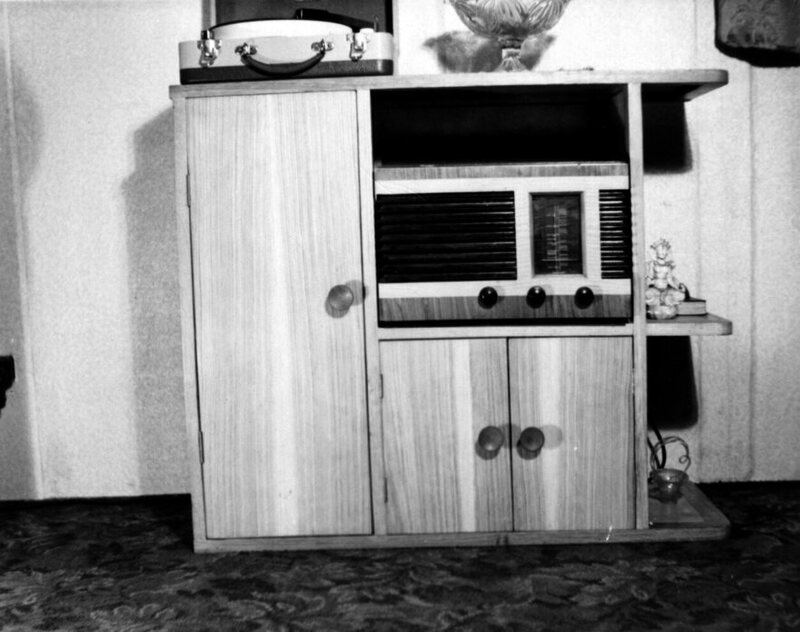 The living room had built in cupboard for which Dad made glass doors and thus turned it into a display cupboard. There were three drawers beneath the cupboard, the bottom one of which contained our toys. 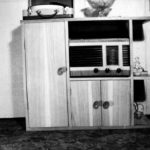 Dad was a skilled and enthusiastic carpenter and made a cabinet for the living room which held the wireless, gramophone and records. It had open shelves at one end for decorative nick nacks. 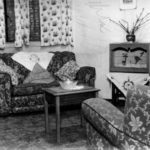 The living room, although not large, had a three piece suite, a dining table and chairs, a piano, the cabinet that Dad made, a small table that held the budgie in his cage and a coffee table. 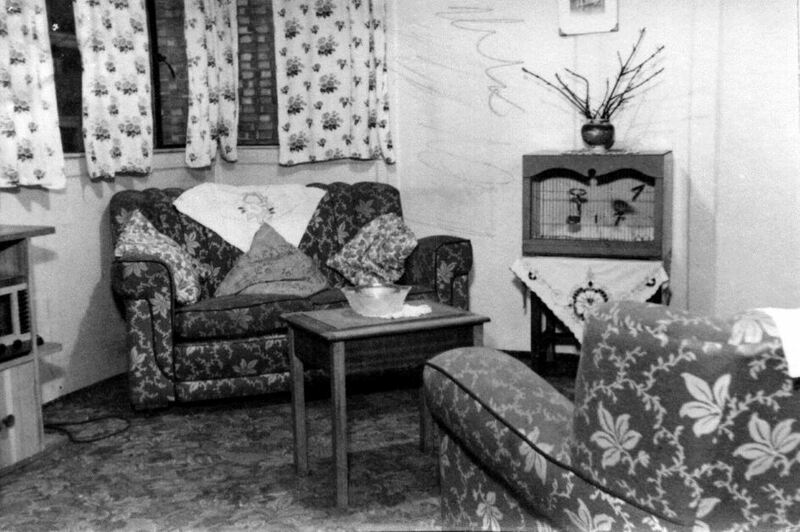 We were very comfortable and cosy there and as we also had a bathroom, which many houses at that time didn’t have, I was the envy of many of my friends. 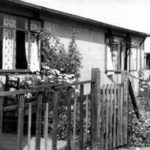 We left our prefab and Tottenham in 1957 and moved to Potters Bar, but my family roots are there going back to the 1880’s. 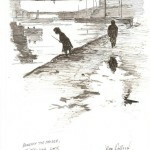 I fondly remember my childhood in Tottenham and still feel a connection with it even now, though I moved away 60 years ago. 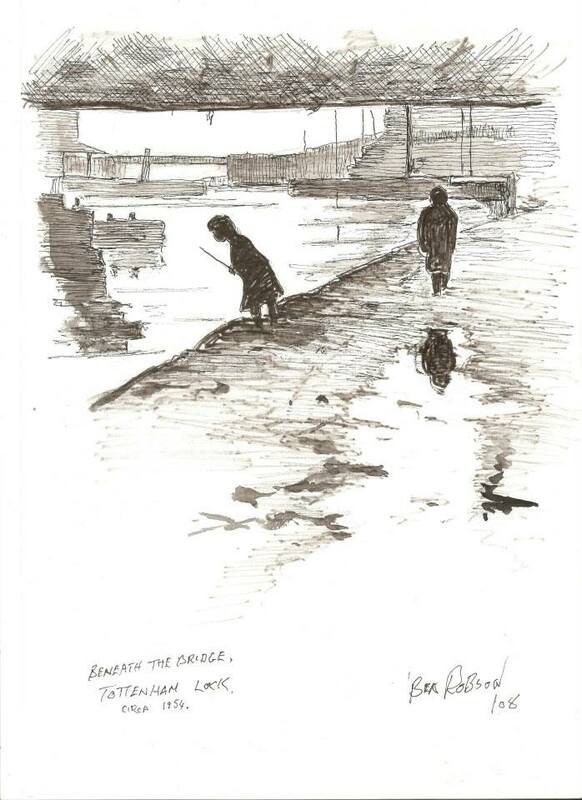 Below is a sketch of Tottenham Lock by Ben Robson – my dad, with a very young me under the bridge and the Harris Lebus factory to the right. 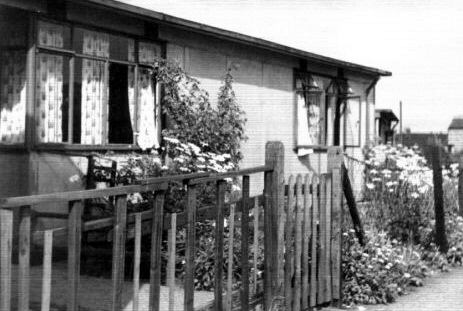 I have vague memories of our time there, being only just five when we left, but I remember the layout quite clearly and the garden that ran right round the prefab. Mum loved her sunken garden at the front.